Riley Luettgerodt is averaging 15.7 ppg so far this season. 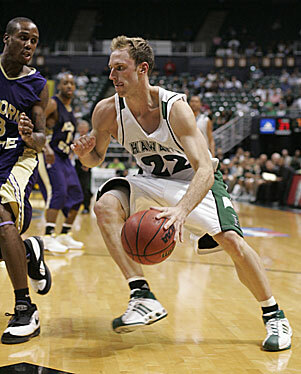 Over the years, escaping from The Pit has long been a tough task for the Hawaii basketball program. In 26 visits spanning from 1964 to 1999, the Rainbow Warriors emerged with wins on four occasions, and they return tomorrow to renew an old rivalry with former Western Athletic Conference member New Mexico (5-0). The game, UH's first road test of the season, is scheduled for 4 p.m. Hawaii time. The Rainbows (1-2) arrived in Albuquerque, N.M., a day after picking up their first win of the season, a rout of Alcorn State at the Stan Sheriff Center during which they got contributions from all 10 available players. "These guys have worked awful hard, and we'll take 10 guys on the road and they may all have to play," UH coach Bob Nash said. "So (the Alcorn State game) was a great opportunity to be able to use those guys." Hawaii will face a New Mexico team that has won its last 25 nonconference home games and is undefeated under first-year coach Steve Alford, a former Indiana great as a player and Iowa head coach for eight years. The Rainbows are led by Bobby Nash, Riley Luettgerodt and Jared Dillinger. New Mexico guard J.R. Giddens was named Mountain West Conference co-Player of the Week yesterday after averaging 15.3 points and 9.5 rebounds in four UNM wins last week. For his first road trip as Hawaii coach, Bob Nash decided to take the Rainbow Warriors back to some familiar, albeit unforgiving, territory. In his tenure as a UH assistant, Nash got to know The Pit -- New Mexico's storied home arena -- quite well in annual trips through the 1980s and '90s. Since the start of the series in 1964, Hawaii has a 2-21 mark in Albuquerque, N.M., as the Rainbows renew the rivalry with the Lobos tomorrow in a nonconference meeting. "It's always a hostile environment and it's legendary for being a tough place to play," said UH coach Bob Nash, who ventured into The Pit 18 times as a UH assistant and associate coach. "But we're just going to go out and play and maintain our focus on getting better every day. "We're looking at this as strictly a business trip and not worrying about where we are and the environment." Tomorrow's game is the front end of a home-and-home series between the teams. New Mexico visits the Stan Sheriff Center on Dec. 27. It is their first meeting since the Lobos left the WAC in 1999. "I think it's a healthy rivalry; there's a lot of history there," Nash said. "With (UNM coach Steve Alford) being a new coach there and myself being new, we decided to do this and I think it's a good thing." The Rainbows flew out of Honolulu shortly after Sunday's 84-55 win over Alcorn State, the first of the season for Hawaii (1-2). Upon arriving in Albuquerque yesterday, they went straight to practice at Highland High School and were scheduled for a quick shoot-around last night at The Pit, where New Mexico has won its last 25 nonconference games. "I really like the guys' approach, just real businesslike," Nash said after the first practice. The Lobos enter the game 5-0, with wins over Colorado, Eastern Washington, Presbyterian, St. Bonaventure and, most recently, an 86-58 victory over Loyola Marymount on Sunday. Alford, a standout guard at Indiana in the '80s, coached at Iowa the eight years prior to being hired at New Mexico, where he inherited a team that returned senior guard J.R. Giddens. Giddens started his career at Kansas and leads the Lobos with 13 points and an MWC-best 8.8 rebounds per game. The co-MWC Player of the Week is coming off a 21-point night against Loyola Marymount on Sunday for the Lobos, who average 80.2 points as a team. "They have good personnel, but so do we," Nash said. "It's about being in position to help each other. We'll play man (defense), but it's always with the thought that someone's going to have your back." The Rainbows, still minus guard Matt Gibson, played all 10 available players against Alcorn State. Forward Bobby Nash continues to pace the Rainbows in both scoring (22.3 ppg) and rebounding (6.7 per game). Guard Riley Luettgerodt scored 20 points on Sunday to raise his season average to 15.7 ppg. "Its a big test, but again, we're in preparation for what's to come once we get into the conference," Bob Nash said. "We're going to have to get on the road, travel, practice -- this is all preparation for the WAC."